We are real exited and proud of our Cabernet Sauvignon release from our estate vineyard. 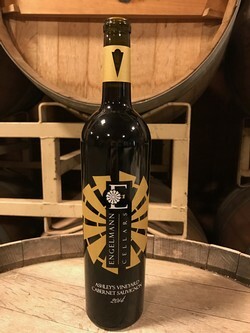 This is a truly great Cabernet Sauvignon aged for 18 months in primarily French oak barrels for a solid structure and smooth tannins to accent the black pepper and fruit characters of the wine. In 1932 Henry and Phil Engelman bought a small plot of land on the west side of Fresno. Two years later he planted its first vineyard. In 2000 the same year that my niece Ashley was born, the vineyard was removed and its second vineyard was planted to premium wine grapes for exclusive use in Engelmann Cellars wines. The sandy, rocky soil puts extreme stress on the vines, which helps develop intense varietal character. This wine displays bright cherry, and plum, with hints of smoky oak. Pair with a big rib eye steak, tri-tip, or a premium cigar on poker night. Amazing! I think this is my new favorite! This wine is wonderful! One of my favorites. I bought a bottle for my mother, and this is her reaction, "I am blown away by it. Sometimes a wine can turn on you after awhile, but I’ve been sipping this glass for over an hour now, and it continues to bring a beautiful pleasure with every sip." It doesn't get any better than that!